Differences in the management of coronary artery disease between men and women have been reported in the literature. There are few studies of potential inequalities of treatment that arise from a primary care context. This study investigated the existence of such inequalities in the medical management of post myocardial infarction in older patients. A comprehensive chart audit was conducted of 142 men and 81 women in an academic primary care practice. Variables were extracted on demographic variables, cardiovascular risk factors, medical and non-medical management of myocardial infarction. Women were older than men. The groups were comparable in terms of cardiac risk factors. A statistically significant difference (14.6%: 95% CI 0.048–28.7 p = 0.047) was found between men and women for the prescription of lipid lowering medications. 25.3% (p = 0.0005, CI 11.45, 39.65) more men than women had undergone angiography, and 14.4 % (p = 0.029, CI 2.2, 26.6) more men than women had undergone coronary artery bypass graft surgery. Women are less likely than men to receive lipid-lowering medication which may indicate less aggressive secondary prevention in the primary care setting. Studies looking at the use of thrombolytic agents show that they are consistently underused in eligible women compared to men. Beta-blockers and Aspirin are under-prescribed in females who are post-MI. [6, 7]Most investigations into gender differences in post-MI pharmacological management originate from specialist care. Until recently there was little published data regarding post-MI pharmacological management in primary care. A study in a primary care setting revealed that women were twice as likely to have a diagnosis of hyperlipidemia, yet a higher percentage of men were on lipid-lowering agents.This study also revealed greater ASA usage by males and no difference in beta-blocker usage, although this was not a predefined outcome measure. Gender differences may indicate the existence of troubling inequalities in the delivery of health care by a publicly funded system. Consequently, there is a need for further studies to explore the existence of gender inequalities in cardiovascular care in family practice, particularly with respect to post myocardial infarction care. The purpose of this study was to determine whether a clinically significant gender bias exists in the medical management of post myocardial infarction patients in an academic family practice setting. Our target population included all patients aged 60 years and over who, in 2000, were registered patients at the Family Practice Unit at Sunnybrook and Women's College Health Sciences Centre with any history of prior myocardial infarction. To narrow our search yet obtain a high yield of patients, we conducted a search using the computerized billing record using code 412 – the ICD-9 code for coronary artery / atherosclerotic heart disease. Before the study, we established that a sample of 120 males and 120 females with a prior history of MI would have an 80% power at the 0.05 significance level to detect a 10% difference in pharmacological management. This was based on an average 10% difference reported in previous studies. The study was approved by the Research Ethics Board of the Sunnybrook and Women's College Health Sciences Centre. We then conducted a pilot chart audit of 10 randomly selected males and 10 randomly selected females, looking for a history of MI. The charts were audited for demographic characteristics, co-morbid illnesses, modifiable cardiovascular risk factors, pharmacological therapies and non-pharmacological therapies. The primary outcome measures were differences in the proportion of men and women treated with ASA, ACE inhibitors, beta-blockers and lipid-lowering agents. Secondary outcome measures were non-pharmacological therapy and invasive interventions. This pilot yielded only 5 patients with a previous MI, from which we determined that a random sample would not yield the sample size required for the power of this study. Hence, it was decided to audit all of the charts found under billing code 412. The data were entered into Microsoft Excel 97. Continuous data were analyzed by T-tests and categorical data by chi-square and the Mantel-Haenszel test. Statistical significance was set at 0.05. All significance tests were two-sided. Outcome measures were differences in means and proportions and 95% confidence intervals. Analysis was done with EpiCalc 2000. Figure 1 summarizes the process by which the audit was conducted. The audit yielded 966 charts – 530 males and 436 females – excluding patients who were deceased at the start of the study or had left the practice. Of the 966 charts, 801 were found – 443 males and 358 females. Of the 801 charts found, 223 patients had a history of prior myocardial infarction – 142 males and 81 females. The average age of the women was significantly greater than that of the men. The average age was 79.6 for women and 73.7 for men (Difference 5.9 years 95% C.I. 3.44–8.36 p = 0.000004). Table 1 summarizes the modifiable cardiovascular risk factors. Women and men were similar with respect to smoking status, hypertension, and hyperlipidemia. Co-morbid illnesses including diabetes and congestive heart failure occurred in similar proportions of men and women. Table 2 summarizes the main outcome measures. No statistically significant differences in medical management between men and women were found for the proportions of males and females prescribed ACE inhibitors, beta-blockers, ASA and anti-coagulants other than ASA. There was a statistically significant difference in the proportion of men taking lipid-lowering agents (Difference 14.6%: 95% CI 0.48–28.7 p = 0.047). This difference remained after adjusting for the age imbalance between men and women (Mantel-Haenszel age adjusted Odds Ratio 1.2918 95% C.I. 1.0348–1.6126, p = 0.0319). Table 3 summarizes the non-pharmacological interventions. There were statistically significant differences between men and women in utilization of angiography and coronary artery bypass graft surgery. Specifically, 25.3% (p = 0.0005, CI 11.45, 39.65) more men than women had undergone angiography, and 14.4 % (p = 0.029, CI 2.2, 26.6) more men than women had undergone coronary artery bypass graft surgery. The results of this study among primary care patients with a prior history of myocardial infarction found a statistically significant difference in the prescription of lipid-lowering agents between males and females. The study failed to detect a significant difference in pharmacological management between men and women in the use of ACE inhibitors, beta-blockers, nitrates and anticoagulants. Women were older than men, but otherwise patient baseline characteristics, modifiable cardiovascular risk factors and co-morbid illness were similar, which further supports these results. The reported difference in the use of lipid-lowering agents is statistically significant and likely clinically relevant. The point estimate of the difference was 14.6 %. This is higher than the 10% level predetermined for clinical relevance. The confidence intervals are wide but exclude a null result. This result confirms the findings of Hippisley-Cox, who reported a 10% difference in prescription rates of lipid-lowering medication between men and women. In this study, similar proportions of men and women were documented to have hyperlipidemia, suggesting that women are not being as aggressively targeted for secondary prevention as are men. There appeared to be a sub-optimal use of ACE inhibitors with slightly more than 50% of men and women on these medications. The results of the Heart Outcomes Prevention Evaluation (HOPE) trial has been known for some time but the final report was only published last year. Perhaps this represents a delay in the implementation of current data. This study has several limitations. 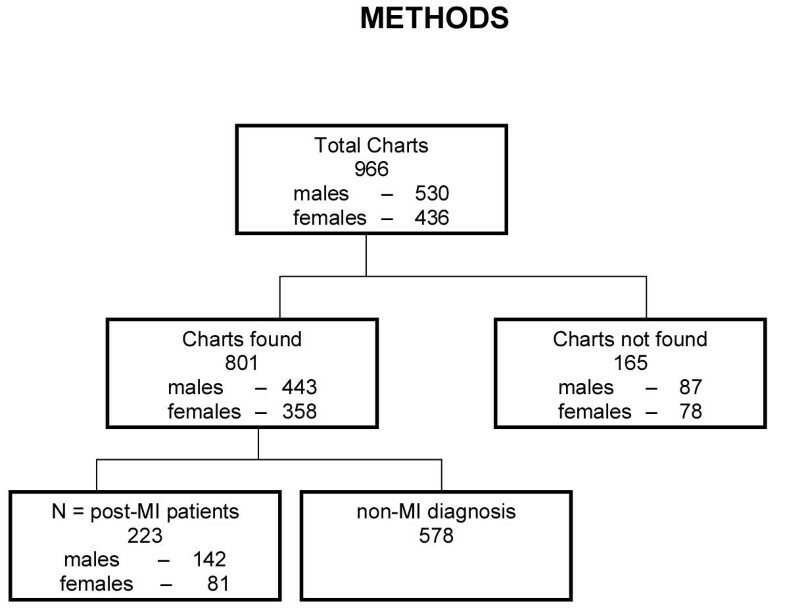 The sample size of 223 (142 males, 81 females) post-MI patients is relatively small, and there were more males than females. This is unlikely to introduce a systematic bias. The study did not reach the sample size requirements originally stated but did have sufficient power to detect a 15% difference. The proportions of men and women taking other medications were very similar. By including the entire population of patients under billing code 412, selection bias has been essentially eliminated. The data obtained for this study is limited to information in the charts reviewed. This is likely one significant reason for the small number of post-MI patients receiving cardiac rehabilitation. The majority of charts indicated that the patient had undergone rehabilitation through progress reports. Different rehabilitation facilities may not have been aware of their clientele's physicians resulting in no progress reports being forwarded to their chart. There was a significant number of missing charts totaling 165 charts. These may have been mis-filed or in the possession of physicians or other staff. Attempts to locate each chart in this study were made only once. No further attempts to find the missing charts were made to avoid any selection bias. As such, the number of missing male charts (87) compared to missing female charts (78) was not statistically significant. Contraindications to specific medications were not investigated in this study. Such contraindications may explain the low number of male and female patients on ACE inhibitors. In addition to the above-mentioned limitations, this study was limited to the population of patients at the Sunnybrook family practice, a population that consists mainly of elderly patients. While some of the results of this study provide reassurance in the appropriateness of medical management of post-MI, the ability to extrapolate these results to the general population may be limited. Further studies examining gender differences in the treatment of cardiovascular disease in primary care are required. Nonetheless, the results of this study suggest the need for improvement in the management of all post-MI patients, as well as offering encouragement that effective post-MI management is being applied relatively equally to both men and women. RD and UP initiated and conceived the project, conducted the chart audits, data entry and contributed to the writing of each draft of the manuscript. RU co-conceived the project, supervised the project, conducted the statistical analysis and contributed to the writing of the manuscript. All authors read and approved the final manuscript. The authors would like to thank Shari Gruman for her expert assistance in preparing the manuscript. Dr Upshur is supported by a Research Scholar Award from the Department of Family and Community Medicine, University of Toronto and a New Investigator Award from The Canadian Institutes of Health Research.